In an attempt to make the IT Support experience as easy and as stress free as possible, I would like to ask all staff to go through the following process when submitting support requests. Your room number or mode of contact with sufficient detail (alternate room number, mobile number, times of availability etc.). You will receive a confirmation from the UWA Helpdesk System that your ticket has been opened. I check the ticketing system multiple times per day and I will receive your request and respond confirming receipt. If you wish to add any additional information to your ticket, please reply to any of the emails you received from the system and all information will get added to your ticket. Before the implementation of the UWA centralized email and calendaring system (ECS), the School of Physics issued @physics.uwa.edu.au email addresses to staff and post-grad students. With the implementation of ECS, each @physics.uwa.edu.au address has been forwarded to an ECS mailbox corresponding to the appropriate person. With the decommissioning of the School of Physics email gateway, the conversion between @physics.uwa.edu.au email address to @uwaemail address is being migrated to ECS. All existing @physics.uwa.edu.au addresses will continue to work for those that already have them. Before using any School of Physics computing facilities (including school and campus networks) you should be aware of and agree to the University's IT Policies. 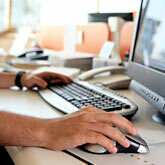 Further information can be found on the University's IT Services (ITS) website..